Whether you’re building a model or trying to simulate a scenario within your analysis, at some point in your Excel career, you’re going to need to use a randomized set of data. If you need to create a purely random set of numbers, with no specific constraints or parameters, you can just use the RAND function in Excel to generate those numbers for you. 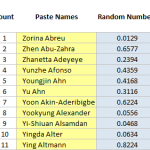 While Excel’s random number generating formula will help you some situations, there are many analysis and simulation cases where it simply won’t be realistic. For example, let’s say that I wanted to simulate the test scores for a group of students on an exam and I know from past history that the average score is a 80. The lowest possible score is 0 and the highest possible score is 100. While I want a randomized result, I know that the test scores are not going to be uniformly distributed between 0 and 100. However, if we used Excel’s basic RAND formula without any adjustments, that is the output that Excel would create for us. Before we go further, please note that this is an Excel blog and not a statistics blog. 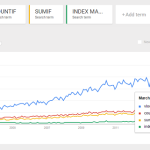 Therefore, I’m not going to spend much time on statistical proofs or mentioning famous mathematicians. I’ll try to keep it as simple as possible and focus on Excel execution. The normal distribution, also commonly referred to as a bell curve, is based on the assumption that a distribution of values generally cluster around an average. Within the distribution, very high and very low values are still possible, but are less frequent than the ones closer to the average. In nature, we know that this type of clustering occurs, as on the aforementioned test example, as generally a lot of people will score near the average, and generally fewer people will have very high and very low scores. A “random” normal distribution is just a random set of data that collectively matches the characteristics of a normal distribution. The random normal distribution is one the most common data sets that you’ll want to use to make your data look realistic for real life situations. Probability – for the probability input, you just want to input the RAND function. If you look at the uniform graph to the left this is what the RAND function would produce by itself – an output where all values have the same probability of occurring. What the NORMINV function does is convert this uniform distribution into a normal one, by making values closer to the mean more likely and values further from the mean less likely. It does so using the next set of inputs as context. Mean – as mentioned before, this is the average that your random values will cluster around. Because you’re using a random set of numbers to generate your distribution, this most likely won’t end up being your actual average or the actual apex of your bell curve. 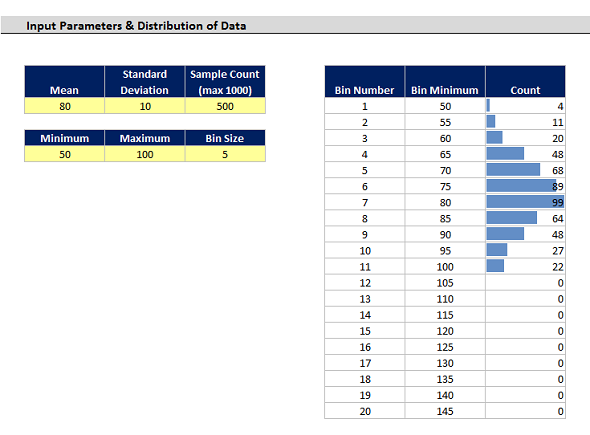 Standard Deviation – the standard deviation will determine you wide your distribution is. The higher the number, the wider your distribution of values. Based on the syntax, what Excel creates a normally distributed set of data based on the mean and standard deviation you provided. The probability input of the syntax is what determines the actual data value that is returned. 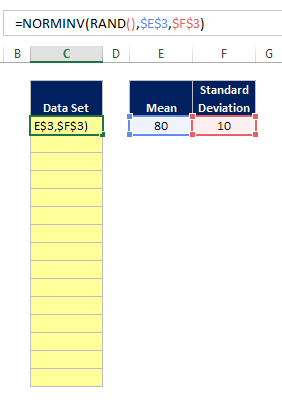 For the probability input, Excel is expecting a number between 0 and 1 which is exactly what the RAND provides. 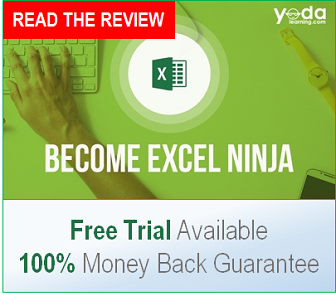 To summarize, what Excel does is take the value from our RAND function, which by itself provides a random set of numbers uniformly distributed between 0 and 1, and forces it to instead to create a normally distributed set of numbers based on a mean and standard deviation we provide. For our example, we’ll assume we only need 15 values. You can put these directly in the formula, but generally it’s better to have them in a separate cell, as it makes it easier to do mass updates to large sets of random numbers. Using our previous example, we’ll assume that the average of our sample should be 80 and the standard deviation should be 10. This is a very important step, as generally, you’ll want to use this formula for multiple cells. You can do this by clicking into the cell reference within the formula and hitting the F4 key. You can do this by double clicking the lower right hand corner of the cell. Now that you’ve created your random number set, you probably don’t want it to change every time you update a cell. Therefore, go ahead and copy your data set values, and perform a Paste Special ( ALT → E → S → V ) to hard code the values. 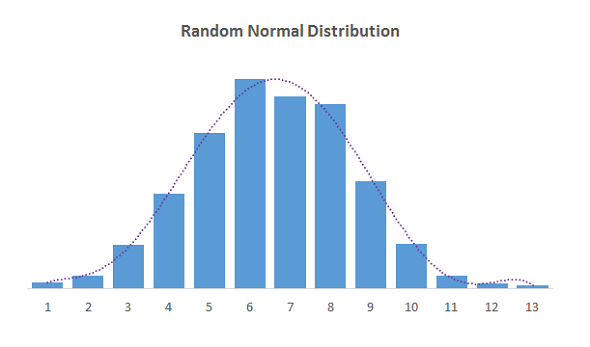 You now have a normally distributed set of random numbers, based on a defined mean and standard deviation. We’ve gone through the process of creating a random normal distribution of numbers manually. 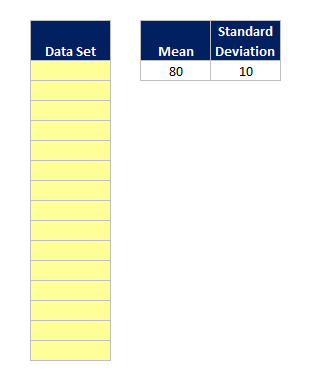 But I’ve also built a simple Excel template that will help make this process a lot easier. Once you’ve set your values, one of the key features of the template is providing you a quick of the distribution of the random data you’ve created. This is done with the “Count” cells to the right, which are conditionally formatted with data bars. This basically provides you a histogram on its side. I didn’t want to go through the trouble of creating a graph because this is supposed to be a flexible, quick and dirty view of your data. It would defeat the purpose if you had to mess around with chart formatting as you were playing with your inputs. 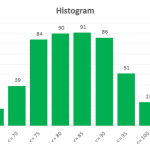 To adjust the “histogram”‘ view, you should change the minimum and bin size to get the right view of your data. I’ve included 20 bins for you to work with, but this can be increased by appending bin numbers and copying the two other formulas down. I’ve nested the NORMINV formula inside the ROUND function so that the random values returned are always integers. You can remove this or change the number of decimal places returned by adjusting the formula. For the Minimum and Maximum limitations, I’ve made the assumption that if the NORMINV formula comes up with a value either less than the minimum or greater than the maximum, it’ll simply return the minimum or maximum respectfully. If this is not desired, you can simply change the logic in the “Accounting for Min and Max Limits” field. 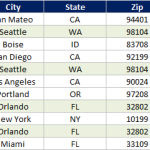 If you need to add more numbers to your random sample (more than 1,000 values), you can simply insert rows into the data portion of the template and copy down the formulas. Note that any time you recalculate you save or add new values, your data set will change because the RAND function will recalculate. To save your values, all you need to do is copy from the green cells and do a Paste Special → Values to hardcode the numbers. I chose not to build in a macro to do this since this is intended to be a relatively simple template. Very helpful and comprehensive description of exactly what I needed. Thanks. What ab about 5-points Likert’s scale. Can it ever be normal? Just wanted to know why the mean and standard deviation of the generated set of fixed numbers differs from that specified when generating the random numbers. The fixed mean and standard deviation are set for the population. We are drawing a sample from this population and it is obvious that sample mean and standard deviation will differ from that of the population. If the sample size is large then the sample mean and standard deviation will become closer to the population mean and standard deviation. Send your email ID so that I may share a workbook explaining the situation. Thank you very much for an excellent tool and explanation. This is just what I needed! This is a great utility. Thanks so much for sharing. How did you get the histogram effect? You’ve amazing knowlwdge in this article.